What’s Missing from Showcase Presents: the Trial of the Flash? Astute readers have no doubt noticed that Showcase Presents: The Trial of the Flash, in stores today, does not cover a continuous string of issues from #323 through #350. It starts with the desperate race around the world in which the Flash kills Professor Zoom, and it ends with fallout from the Flash’s trial, but along the way it skips Flash #328 and #337-339. The Flash #328 is a reprint issue, with a couple of pages of framing sequence added. The reprint in question is Flash #163, the wedding of Barry Allen and Iris West, which was also interrupted by Professor Zoom. In the original run, it served as a reminder of just how long the rivalry had run between Barry Allen and Eobard Thawne, and how personal it was. It’s an obvious choice to cut. The missing persons case for Barry Allen. The mystery of why the Flash’s lawyer hates him. One of the jurors has a strange encounter, which becomes a major plot point near the end of the storyline, and #339 ends in the middle of a battle, which picks right up in #340, and leads into another key plot point: Big Sir beats Barry so badly that he needs facial reconstruction surgery. Presumably the issues were cut for page count, but I do have to wonder why DC chose these three issues. 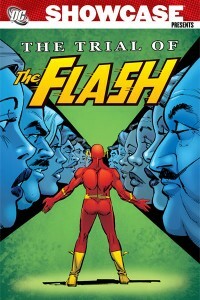 This entry was posted in Flash History and tagged Collections, Trial of the Flash on August 10, 2011 by Kelson. thanks for pointing out what was missing. i was thinking of getting this, but at the same time i have managed to get the single issues throughout this run (and a few more to boot) and while it would be a good read start to finish, it would be odd to go from #336 to some mid fight sequence in #340.. odd choice to be sure. Thanks for this post, Kelson. I have this waiting for me at DCBS and its good to know what the missing issues entail. It’s pretty ridiculous that they’d leave these three issues out. I know the books are already big, but would an extra 70 pages or so really hurt? I wish DC’s collections would be as comprehensive as Marvel’s have been the past few years. Why is DC that petty on including those 3 issues? I fondly remember that Big Sir arc. Thanks for the information, I am going to cancel my order now. I can understand the reprint issue, but original issues? I guess if those issues didn’t deal with the trial DIRECTLY, DC thought they could leave them out. But why not add them to get the entire story? At this point, extra page count shouldn’t really matter, especially if it’s black & white reprint. Either way, I’ll read it. I’ll stick to my original issues and get the whole story!